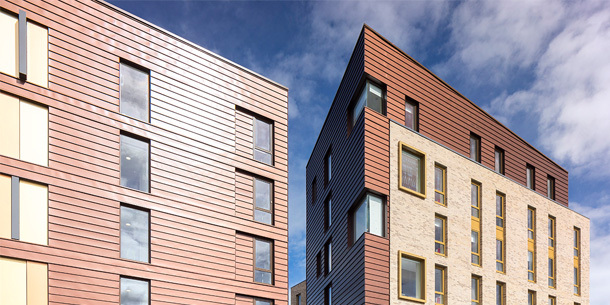 GWP Architecture is delighted to announce that our 155 bedroom Merlin Point student accommodation scheme has opened to its first intake of students. The development at the Gateway to the Coventry University Technology Park on the corner of Deasy Road and Paradise Street is close to Coventry city centre. The scheme constructed by Construction Partnership UK Ltd for Beechfield Estates was delivered to BREEAM ‘Outstanding’ levels. Constructed from offsite manufactured timber frame panels and en-suite pods the sustainable scheme is highly insulated and air tight. It also utilises a CHP, mechanical ventilation heat recovery (MVHR) systems, LED lighting and low water use fittings. It contains a mix of both en-suite studio and en-suite cluster flat bedrooms with communal social spaces on the ground floor. For further information please head to our project page.